Nothing beats the welcoming aroma of steaming hot coffee as you wait for your breakfast toast to pop in the morning. Quicker than a filter coffee, and way more satisfying than instant, a French Press style Cafetiere delivers a consistently wholesome brew with minimum fuss and effort. Here are the 6 best Fench Press style Cafetieres that I’ve found for the family breakfast table, parties, entertaining and solo-slurping on the move! 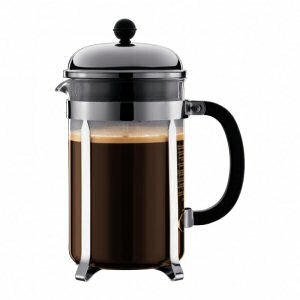 Why choose a French Press Cafetiere for serving coffee? Standing in a queue for your morning Americano may be fine at Starbuck’s, but it’s not ideal if your family are queued-up in the kitchen waiting for your mini Barista pod machine to gurgle out the next cup. OK, I admit that a Cafetiere may not deliver that intense hit of caffeine and flavour that you get from a Barista served espresso, but it certainly comes close when you’re pressed for time in the morning. For me, the great thing about French Press (Cafetiere) style coffee makers is the simplicity of adjusting the strength of the brew. As long as you use a standard scoop, it’s easy to adjust the strength of your coffee to suit your family, visitors, or your own personal tastes. The other big advantages of a Cafetiere are the ease of cleaning and the lack of waste. Why throw away your cash (and a lot of paper) on disposable filters for a mediocre brew from a filter machine? This may sound like a sad case of OCD, but here’s my personal recipe for a piping hot pot of flavoursome Cafetiere coffee! Most modern Cafetieres are based on a simple design, with very few complicated parts. Although stylish nick-nacks and fittings may add visual appeal, they can make a French Press difficult to clean, or more prone to wear and tear. Top of my list of essential Cafetiere features is an easily removable jug. This just makes it much more convenient to clean – without leaving unattractive stains on the glass! If you’re buying a high-capacity Cafetiere for dinner parties or entertaining, think about the weight of a fully-filled, 1.5-litre coffee jug. A big, stainless-steel French Press may impress your guests, but have you got the biceps to lift it? With these buying tips in mind, take a look at these 6 top quality, French Press style Cafetieres. I’ve also added a few of my OCD inspired, essential extras for brewing the perfect cup! Rather than holding the coffee in a toughened glass jug, this high-capacity VonShef 1.5l Cafetiere is made from dual-wall stainless steel with a satin finish. Just like a thermos flask, the insulating air gap between the walls of the pot helps to keep the coffee hot. I’ve chosen this model as my recommendation for a high-capacity Cafetiere due to the design failings of most high-capacity coffee makers from other manufacturers. Most high-quality 1.5-litre Cafetieres are designed with a bolt-on handle. Over time, it can become difficult to remove the glass jug from the bolted collar or cradle. This makes it really difficult to give the glass jug a thorough clean. With this glass-free VonShef 1.5l Cafetiere, cleaning is quick and simple. Click here for detailed pictures of this stylish coffee maker’s accessories and inner workings (Amazon). Also available in a RED stainless steel finish (link) . Marginally lighter than a 1.5 litre stainless steel French Press, this Bodum Chambord 1.5l Cafetiere is an all-time classic that’s become an essential kitchen accessory for sociable coffee drinkers worldwide. This model has a chromed cap with internal plastic insulation. The stainless steel plunger assembly follows the traditional French Press design. The Bodum Chambord is a great coffee maker for entertaining. The only down-side with this model is the difficulty of cleaning – especially if there’s a build-up of coffee grains behind the chrome plated metal frame. Always take extra care if you need to loosen the handle screw to remove the glass. A little too much tension when refitting the screw can easily break the glass jug. Luckily, spare Bodum Cafetiere jugs are inexpensive and widely available. Click here to view this 1.5 litre Bodum French Press on Amazon. If you like your coffee piping hot, a coffee pot cosy is a handy extra for this BIG Bodum Cafetiere. The UK Kitchen Cookshop has a range of Cafetiere covers in stock. I particularly like their CKS Neoprene Insulating Jacket (link) for a big, 12 cup Cafetiere like the Bodum Chambord. With 6 colour options on offer, this Le Creuset 750ml Cafetiere can be colour matched with your kitchen decor. Though this link will take you to Amazon, this popular (rather posh) brand is also on sale at John Lewis and other upmarket kitchenware retailers. Serving-up about two decent mugs of coffee, the Le Creuset French Press Cafetiere is ideal for cosy couples who enjoy a quality brew in the morning or afternoon. Afterwards, the pot is very easy to clean, though the finish can be prone to chipping. It’s best to wash this Cafetiere as a separate item. If you like the stoneware styling of this posh Le Creuset Cafetiere, the company produce a wide range of cups and crockery to match. Click here to start your collection with this attractive French style coffee maker! I was given a Bodum 350ml Travel Cafetiere as a birthday gift a few years ago and it’s still making superb coffee and loose leaf tea! Combining a slurp-style coffee cup and a miniature French Press, this neat little coffee maker is ideal for a brew while you’re away from home. Bodum’s Travel Cafetiere is incredibly easy to use. Just unscrew the top and drop a couple of scoops of coffee into the mug. After that add your water (milk and sugar), then screw the lid and plunger back on top. After a minute or so, press the plunger and enjoy your brew. The airgap insulation keeps your drink warm much longer than you expect. For convenient portability, there’s also a neat seal that clips over the drinking spout. At the end of the day, you simply flush the mug and plastic filter under the tap to keep your travel press looking good as new. Click here to check out the stylish colour options currently on offer from Amazon! Keeps coffee nice and hot! 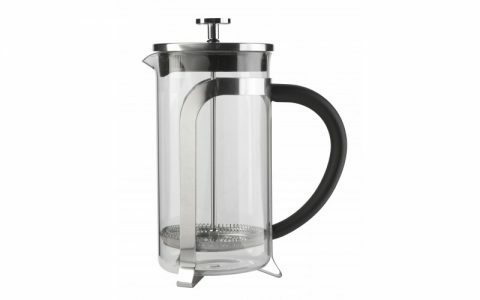 Love the traditional profile of this ProCook 600ml French Press Cafetiere – just wish that I could find one with 1 Litre capacity! ProCook claim that this french style coffee pot will make 6 cups of piping hot coffee. In reality, you’re going to get about two standard mugs from this delectably styled French Press. Lots of buyers have confirmed that the double stainless steel walls do indeed keep your coffee nice and hot, so this Cafetiere could be perfect for two moderate coffee drinkers. Close inspection of the manufacturer’s blurb highlights a warning that hot coffee can splurge out of the lid if you push the plunger too hard. One or two buyers have also mentioned this problem in their coffee maker reviews. Handle your ProCook French Press gently and you should have few problems. We’ve been using this Bredemeijer 1 litre Leopold Vienna Cafetiere for years and it still looks as good as new! The secret is the open chromed cradle that holds the heatproof glass flask. Apart from being ultra lightweight, it’s easy to slip the glass jug out of the cradle and give the whole coffee maker a fast, efficient clean. With no nuts and bolts holding the cradle in place, there’s no risk of cracked glass. Bredemeijer is a Dutch company with a solid reputation for manufacturing luxury tea and coffee ware products. Bredemeijer acquired the German, Leopold Vienna brand in 2010. The company ethos is to design superior kitchenware products with exquisite form and functionality. Thankfully, their attractive, thoughtfully designed Leopold Vienna Cafetiere is available at a very affordable price! This Leopold Vienna LV01533 Coffee Maker is absolutely perfect as an everyday French Press coffee maker for the kitchen table. The one-litre capacity flask holds enough coffee for 3 or 4 regular sized mugs. A couple of coffee addicts can expect 2 extra-large mugs (with warm-ups) from this 1l coffee pot! Click here to view this stylish family French Press on Amazon – limited numbers available! An accurate measure is the key to consistent coffee making, and this Professional Orblue Coffee Scoop Set will ensure a consistent cup from every brew. Well designed and manufactured, these stainless steel coffee scoops are just as accurate as the cheap plastic scoops that come with your cafetiere – but so much more stylish! The long handles make it easy to reach that very last spoonful in the bottom of the bag, and the deep bowl is ideal for holding the perfect ‘level’ measure. Even if you’re not tempted to buy this professional coffee measure set yourself, how about ordering one as a birthday gift or Christmas ‘stocking-filler’ for a coffee-loving friend? Click here to check out this Orblue Coffee Scoop Set on Amazon! Thanks for reading my French Press coffee maker reviews and recommendations – more top quality homeware reviews coming soon! As a member of the EU Amazon Associates Programme, I receive a small fee for each item purchased after clicking one of the Amazon product links above. My total annual earnings from the programme are typically less than £50.